Ulefone Armor Mini is a compact and durable base phone with long battery life. A shockproof and waterproof traditional button phone. 5/5 Työluuriksi tilasin koska muistuttaa vähän vanhaa kunnon nokian kumikapulaa,ei mitään ylimääräisiä päivityksiä vaan "vanha" kunnon peruspuhelin ja 2 sim korttipaikalla,hyvä akunkesto,yhdellä latauksella vörkkii pari viikkoa helposti.Hyvä luuri esim.kalareissuilla ja bändikeikoilla,ei tarvii pelätä tippumisia,paisti järveen.Suomenkielistä valikkoa ei ole mut kyllä sitä englannillakin pärjää.. Tired of smartphones? Would you rather have a traditional button phone instead of a touchscreen as on today's smartphones? Then the Ulefone Armor Mini can be something for you! Ulefone Armor Mini is a compact and durable base phone with long battery life. A shockproof and waterproof traditional button phone. One could almost say that it is the Nokia 3310's successor. Despite its incredibly low price, the phone has a lot of useful features such as Bluetooth 2.0, camera, flashlight with SOS function, FM radio and dual SIM cards. The ability to use 2 SIM cards can prove really useful as you can have 2 different numbers on the phone. You can use the FM radio even without headphones so you can use it as a radio also in the cottage. The phone has a speaker that's pretty good, its small size despite it. This phone could be a perfect hunting phone for those who just want a phone to be able to call when you are out in the woods. Don't miss this awesome button phone, terribly affordable! 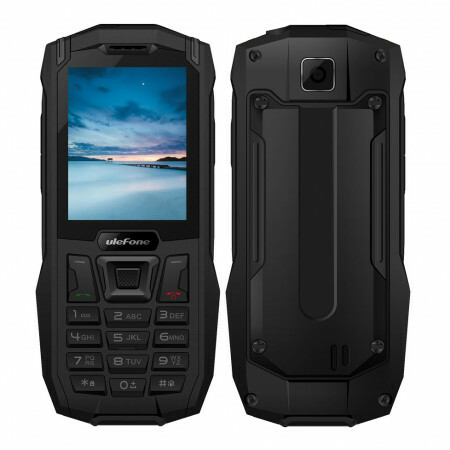 https://www.e-ville.com/en/3149-cell-phones/31343-ulefone-armor-mini-feature-phone.html 31343 Ulefone Armor Mini feature phone http://www.e-ville.com/img/p/31343-156909-fb.jpg 34.95 GBP InStock /Phones & Accessories/Phones/Cell Phones /Phones & Accessories/Phones /Phones & Accessories Ulefone Armor Mini is a compact and durable base phone with long battery life. A shockproof and waterproof traditional button phone.